Week of 2/25/19, on The Lillian McDermott Radio Show! There have been many moments in the last week when I have witnessed resistance to what is. What does resistance look like? It could possibly be depression, anxiety, worry, or complaining, to name a few. Also, I have experienced unexpected changes that, at first, through me off. But then, once I thought outside the box, they can be blessings in disguise. All these experiences have been wonderful teachable moments. With spring right around the corner, it is appropriate to feel like it is time to grow. Growth looks different to many people but sometimes for me, it is a call for “Re-Invention.” Is there something calling you out of your comfort zone or causing you discontentment? If so, congratulations… Let the adventure begin! I am still excited about all last week’s shows… Such great inspirational people who touched my life. I hope you enjoyed them as well. If you missed listening to any of last week’s shows, there are two ways you can still listen. They are updated daily to our website (Click Here to listen) and you can go YouTube, Apple Podcasts, Google Play Music, Spotify,Stitcher, Tunein or iHeartRadio. Search for “Lillian McDermott,” and listen to the podcasted shows, commercial free, at your leisure (Click Here to learn more). Let’s continue to Grow Together! Tuesday, 2-26-19 ~ Last week, cancer coach, Elyn Jacobs, shared the effects Electro Magnetic Frequencies (EMFs) have on our body. In 2002, Lloyd Burrell began to feel ill whenever he was on his phone, computer, and all types of electromagnetic devices in his home and workplace. Although his doctors were baffled as to why he would experience his debilitating condition, Lloyd quickly realized that if he wanted to get better, it would be up to him. Lloyd will share his journey and how he got better. Wednesday, 2-27-19 ~ Recently, the author of “Nutrient Power,” William Walsh, PhD, shared on my show that people who suffer from behavioral health issues had certain deficiencies that were, for the most part, naturally reversable. At that moment, I made a commitment to dig deeper. Dan Hanson, founder of DHA Laboratories, works with Dr. Walsh and Albert Mensah, MD, who consulted with me regarding my lab work. Dan, Dr. Mensah and I will discuss the findings and how I am feeling since my consultation. Thursday, 2-28-19 ~ Have you been stressing about your current situation? Do you find yourself anxious about the future or depressed about the past you wish you could change? 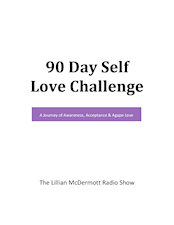 Well, it is time to embrace your current reality and make peace with your “now.” I will share steps on how to make peace with your life and update you with some of the changes on The Lillian McDermott Radio Show. Saturday, 3-2-19 ~ Recently, the author of “Nutrient Power,” William Walsh, PhD, shared on my show that people who suffer from behavioral health issues had certain deficiencies that were, for the most part, naturally reversible. When I asked Dr. Walsh which company handles his testing, he told me it was DHA Laboratories. Dan Hanson is the founder of DHA Laboratories, and he will share how their testing is changing lives. On February 24, 2019 / What is Happening Weekly?